You need three basic ingredients to make these cups: bread, melted butter, and eggs. To make 6 of these, you'll need 8 slices of bread in total. The extra slices will be used to fill the bottoms of the tins to fully cover each entire muffin cup. I used white sandwich bread. Stack your slices and roll the bread out to flatten slightly. Then take a 4 to 4 1/2 inch biscuit cutter and cut circles out of the bread slices (if you're like me and don't have a biscuit cutter that size, use a similar size bowl and cut out the round with a paring knife). Now slice the bread rounds in half down the middle. Press 2 halves into each lightly buttered muffin cup, round side up. Tear off a piece of bread from the extra slices and plug in the hole at the bottom of the muffin cup. I crack my eggs in a small bowl before pouring into each muffin cup. This way I make sure the yolk stays intact. A large egg should just fit in each muffin cup but you can hold back some of the egg white if you find you have a bit too much (another good reason to crack the egg into a bowl first). I like to season the eggs with salt and pepper after baking so I leave them as is and put them in a 375 degree oven to bake. I took them out in about 20 minutes, when the whites are just set, in the hopes of having a soft yolk. It should take 20-25 minutes. While the eggs are baking, I finish pulling together the rest of my meal. I gently ease the egg cups right out of the muffin tin with a little offset spatula. They slide right out and we're ready to serve. I sprinkle them with a touch of salt and pepper and they are ready to go! I really do love eggs and I'm happy that my entire family enjoys them. When my son was a toddler, he had a mild egg allergy. He could eat anything made with eggs without a problem, but whenever he ate eggs straight-up, he had a reaction. Luckily, he outgrew that sensitivity and I can say that he loves to have eggs for breakfast (or whenever) almost as much as his mother! Preheat oven to 375 degrees. Lightly butter 6 standard size muffin cups. Using a rolling pin, slightly flatten the bread slices and cut into rounds using a 4 to 4 1/2 inch biscuit cutter (if you don't have one, use a similar size bowl and cut out rounds using a paring knife). Cut each round in half down the middle. Press two halves into each muffin cup, round side up, overlapping slightly and making sure the bread comes to the edge of the cup. Use the extra bread to patch up any gap in the bottom of the cup. Repeat with all six cups, then lightly brush the bread with the remaining butter. Crack an egg into each of the bread cups (I suggest cracking the eggs into a small bowl first before transferring into the cups; the cup should hold the entire egg but you can hold back some of the egg white if you find it necessary). Season with salt and pepper, if desired (I like to do it after baking). Bake for 20-25 minutes, until egg whites are just set. Run a small knife or offset spatula around the cups to release. Serve immediately. This is exactly my kind of breakfast, Monica. Healthy, nutritious and tasty! This is the coolest thing ever! You could serve them with all kinds of add-ons for a big party - so many possibilities. Eggs and toast never looked so pretty! Very nice :) Have a wonderful week Monica. GAH! Monica - I want these for breakfast tomorrow! They look absolutely delightful. And I'm not just keeping this for Easter either - because it looks fabulous for any day of the year. Pinned! They are cute and most importantly, tasty at that. Thanks for pinning! This is amazing! Love the idea and the best part is that you can play around with different add-ons. Can't wait to make them! You definitely could get creative and you're the perfect person to do it, Sonali! Oh my gosh, these are the cutest! 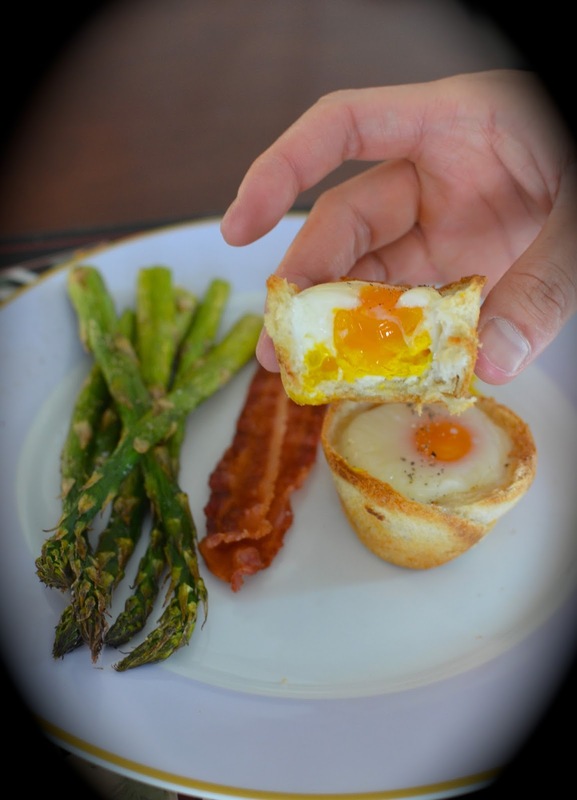 Love the idea of eggs baked into toast cups - so fun and easy! My guys are big fans of eggs too so I know they would love these as well! <3 ! I know...anything popped out of a muffin tin tends to be cute. Easy to eat for kids and just tasty. Have a great week, Kelly. I tried making something similar with a friend of mine last summer but it didnt look anything as gorgeous as these. I lvoe how they turned out and its an incredibly cute idea. I totally get it. It's the kind of thing that looks cute and easy but is it really easy? This one is really easy. No leaking, breaking, burning. I was afraid of things like that with hash brown cups but these were easy. So springy! Love eggs and toast cups! I could eat eggs and toast all the time. Thanks, Kiran. haha oh the mini cadbury eggs - I can't buy them! I have absolutely no self control! These little cups are so cute! And they sound delicious - I love having eggs for breakfast. Eggs are so amazing. I can't say enough how much I love them! I'm kinda crazy. This is such a creative idea for eggs! My husband will love these bad boys! A fun little spin on basic egg and toast, right! Thanks, Ashley. Have a great Easter. I took the easy way and just served the bacon on the side. : ) You have a wonderful Easter as well, Lorraine. Thank you. Fun and tasty is a nice mix. Thanks, Ritu. Egg and toast in one adorable package! What's not to love? Haha it's funny that your fellas think they taste like deep-dish pizza! They are the cutest Monica. HOw adorable would they be for this weekend. The cutest and it will be a hit. These are so cute and look delicious, perfect for a brunch get together! And not too much work or mess involved, which is nice! On Monica, these are so cute...very creative and great for breakfast/brunch...I love it! OH! They are so cute! Such a creative idea for a delicious breakfast! My boyfriend's going to love it! They're fun and not too funky! Hope you make some to enjoy with your b/f! I'll take my eggs in savory form as well, thank you very much! These toast cups are so cute! I'm so glad! Really easy so do give it a try. Have a great Easter weekend! I know what you mean...I've wanted to make the ones with the hash browns but it seemed like it would be more work than you expect. This really was easy and turned out just like this on the first try. We just had spring break - hope you have a good one and enjoy a little more free time with the little ones.